Buy Natures Aid Co-enzyme Q 10 - 90 capsules in the UK from our online shop or directly from our independent Scottish store. If you want to automatically receive an email when 'Co Q10 30mg 90 capsules' is back in stock, just leave your email address below. Co-Enzyme Q10 plays a role in the conversion of the body's reserves into energy. 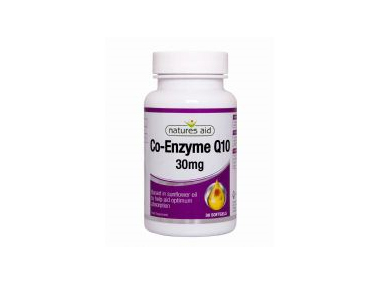 Co-Enzyme Q10 plays a role in the conversion of the body's reserves into energy. It has antioxidant properties and contributes to maintaining healthy cardiovascular and neurological systems. As official Natures Aid stockist, we sell genuine Heart & Circulation directly from our shop in Scotland and online throughout the UK. Where can you buy real Co Q10 30mg 90 capsules safely online? If you are wondering where you can buy Natures Aid Co-enzyme Q 10 - 90 capsules safely online in the UK, then shop with us. We are an actual health foods shop; with real people selling real foods and products. Our award-winning independent shop is located in Stirling, Scotland since 1976. You can buy our Natures Aid nutritional supplements and other genuine Heart & Circulation in store or safely place an order with us online or over the phone. Co Q10 30mg 90 capsules - Natures Aid Co-enzyme Q 10 - 90 capsules in Heart & Circulation and Herbal Remedies, Tinctures & Supplements.